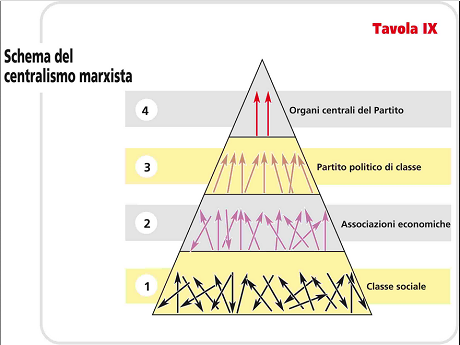 In this article from 1951, Amadeo Bordiga presents a master-summary of various bourgeois ideologies and their underlying social dynamics, before outlining the Marxist conception of party, praxis, and the Marxist approach to the unions. Consciousness can never be anything else than conscious existence, and the existence of men is their actual life-process. If in all ideology men and their circumstances appear upside-down as in a camera obscura, this phenomenon arises just as much from their historical life-process as the inversion of objects on the retina does from their physical life-process. Fascism is by definition eclectic. It doesn’t have a doctrine of its own, and yet it expresses ideologically its role as unifier of the capitalist (imperialist) forces, achiever of the reformist program, and mobiliser of the "middle classes". And it is not fortuitous that its conception is very similar to Stalinism. Like Stalinism, fascism is unable to relinquish certain essential bourgeois postulates such as the legal equivalence of individuals, the "will of the people", and the "popular" character of its rule. The point of departure becomes , however, not the individual subject, but the "Nation", the "People", or even the "Race", which assimilate physical motivations at the outset (see the national-socialist concept of "blood and soil") and express themselves in the State. The Individual is conceived as a "passive receptor" of the Nation/People’s Ethical impulses, and of the Party/State’s voluntarist and activist impulses. The purpose of the Scheme is merely to simplify the concepts of economic determinism. Within each Individual (consequently within the individual proletarian, too) it is not theoretical Consciousness which determines the Will to act on the external environment but exactly the opposite, as shown in the Table by the upward pointing arrows : the impulsion of Physical need, via Economic interests, results in an unconscious Action; only much later is the action criticized and theorized, due to the intervention of other factors. all the phenomena of the present imperialist stage, for over a century now, have been entirely predictable: in economy – trusts, monopolies, State planning, nationalization; in politics – strict police regimes, military superpowers, etc." Errors corrected. This is an excellent article. The graphs have disappeared, so I've submitted a new revision to correct this. Where the energy comes from the class, but is most concentrated at its tip, in the party-centre.